I picked up a sequin habit in my travels through the land of thrift. When I was younger, I thought sequins were for old ladies. Now that I'm older (not old), I can see I was terribly misguided. Sequins rock! They're so sparkly. What's not to love? It's like wearing a party! At my sequin party, you will find radiant orchid purple sequins because it is my favorite color. 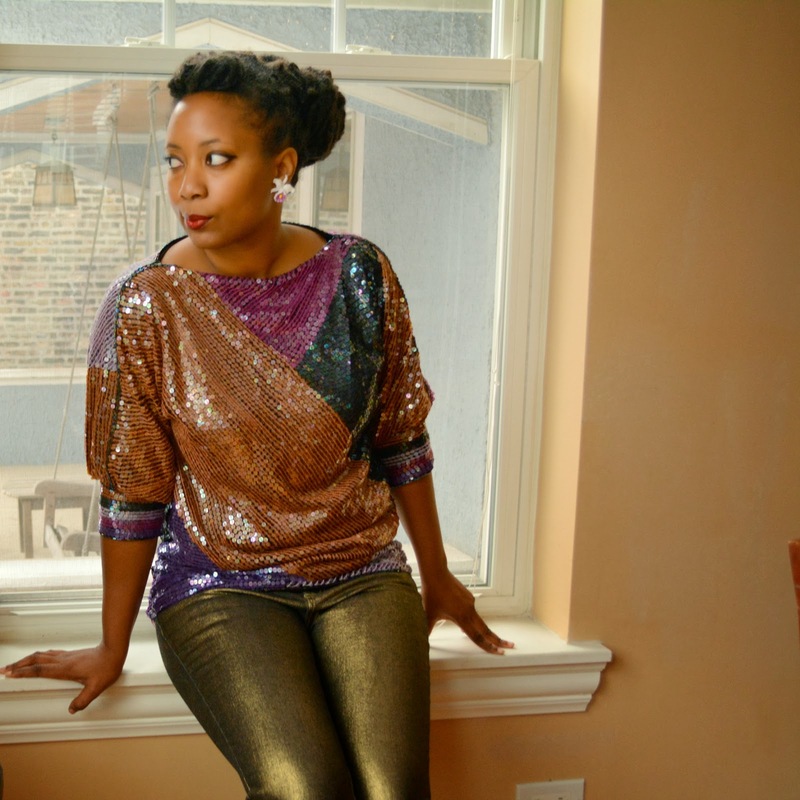 Once I found purple sequins, it brought all the other cool sequins to the party. 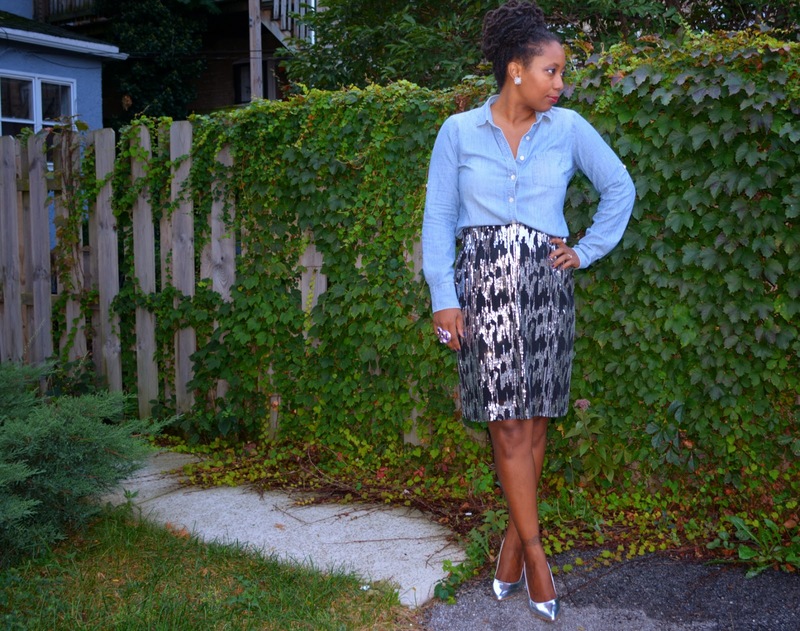 The Calvin Klein sequin skirt was all pencil skirt professional in the thrift store but turned out to be a fun party skirt. Once the shiny silver pumps showed up, they danced the night away. 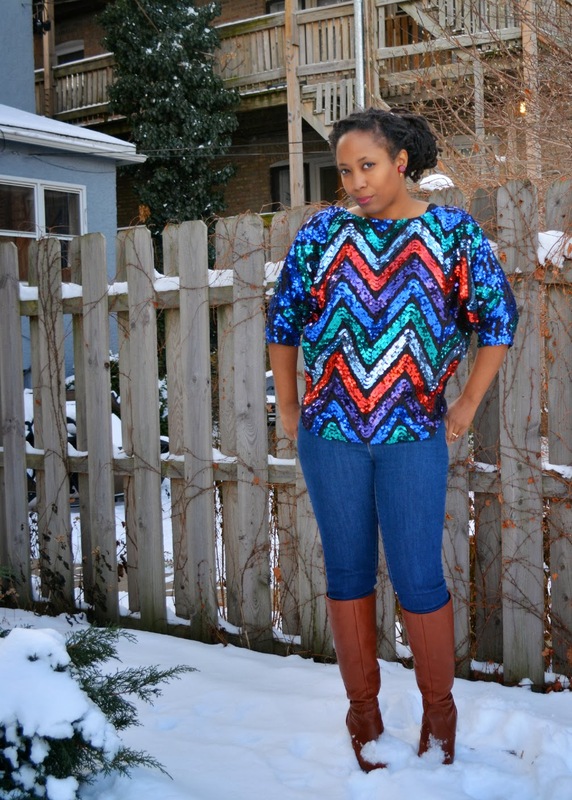 Chevron striped sequin top was a bit shy and hung out in the closet but when it showed up..it showed out! Incredibly loud. Told a lot of jokes and lifted spirits on a cold winter day. Last but certainly not least, multicolor sequin tunic came through quite unexpectedly. Who knew such soft, muted tones carried so much personality. There were some that couldn't make it the sequin party due to timing and budget but I hope they will one day be able to stop by. What parties (themes) do you see in your closet? The Thriftanista Social Club is looking for new members. You don't have to be in Chicago to join the Facebook group just have a love of the thrift. 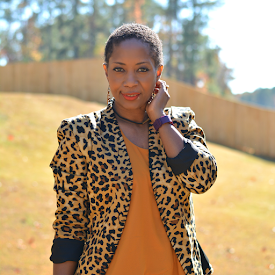 Have you signed up for the next Thriftanista Thrift Up!? Tickets are $20 and includes transportation, food, gift bag, and a 10% discount at Goodwill! Join us. LOVE this post. Sequins are the best! That CK sequin skirt is one of my faves. I have a sequin halter from the 70s, not too sure how to wear. Thanks for the inspiration. The blue skirt and last shirt are my Fav!!! I LOVE how you wear sequins. I'm going to look for some dresses to transform into skirts. LOVE these outfits!! I bought a beautiful gold sequinned jacket before Christmas, and had struggled with outfit ideas, but I love the way you wear your sequins! Love the Sequin Party!! I'm so glad that you have your color as the Color of the Year!! Ah! I can't tell you how much I love to thrift sequins and beads. I bought a sequin blazer (which you can find on my blog) and at first I was a little hesitant to wear it but can't get enough of it. I am dying over your blue dress turned skirt! Glad we found each other on Instagram, look forward to reading more. 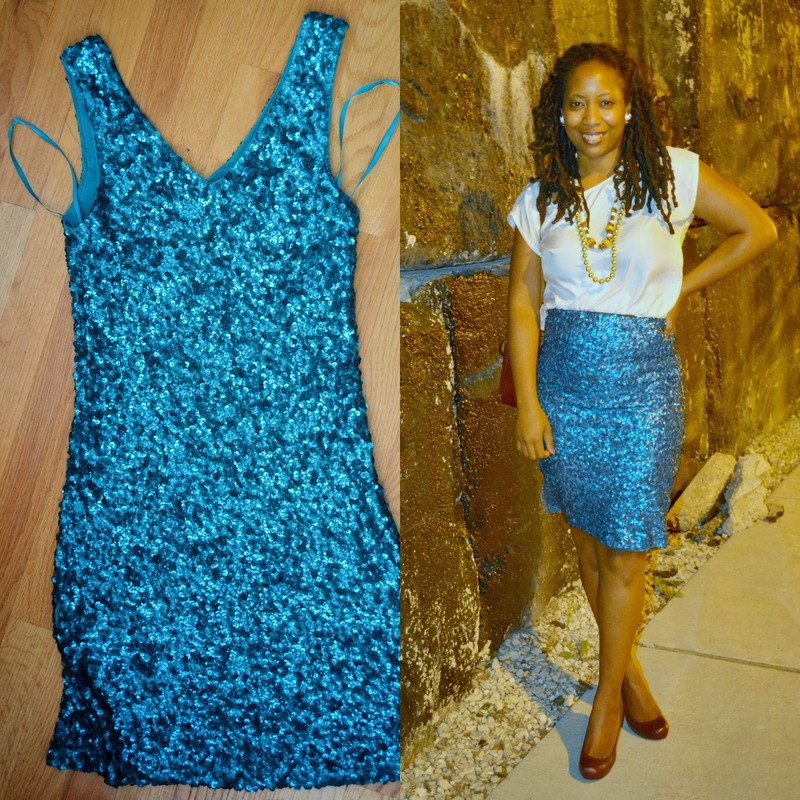 I love the way you showed us how you can weaar sequin as an everyday or evening look.